Eligibility Criteria: Open to patients with a Prolia® (denosumab) prescription and commercial insurance for Prolia®. Patients may not seek reimbursement for value received from the Prolia® Co-pay Program from any third-party payers, including a flexible spending account or healthcare savings account. This program is not open to uninsured patients or patients receiving prescription reimbursement under any federal, state, or government-funded healthcare program, such as Medicare, Medicare Advantage, Medicare Part D, Medicaid, Medigap, Veterans Affairs (VA), the Department of Defense (DoD), or TRICARE, or where prohibited by law. 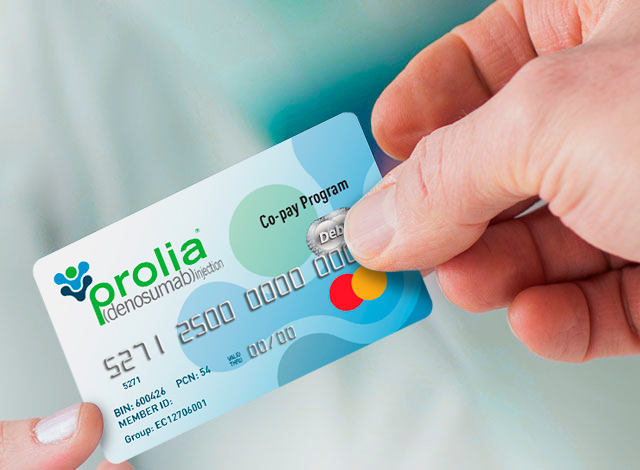 If at any time patients begin receiving prescription drug coverage under any such federal, state, or government-funded healthcare program, patients will no longer be able to use this card and you must call the Prolia® Co-pay Program at 1-844-369-9962 (9:00 am- 8:00 pm EST, Monday-Friday) to stop participation. Restrictions may apply. Amgen reserves the right to revise or terminate this program, in whole or in part, without any notice at any time. This is not health insurance. Program invalid where otherwise prohibited by law. Program Details: The Prolia® Co-pay Program provides financial support for eligible commercially insured patients. The program does not provide support for supplies, procedures, or any physician-related services associated with Prolia®. For eligible patients, the program covers the amount of OOP cost for Prolia® that exceeds $25 for each dose, up to a maximum benefit of $1,500 per patient, per calendar year. Patient is responsible for costs above this amount. Patient card is reset every January 1. Patients need to re-verify their eligibility on a yearly basis. *See Patient Eligibility Requirements and Coverage Limits for full eligibility details; other restrictions may apply. Additionally, if patients become aware that their health plan or pharmacy benefit manager does not allow the use of manufacturer co-pay support as part of their health plan design, patients agree to comply with their obligations, if any, to disclose their use of the card to their insurer.